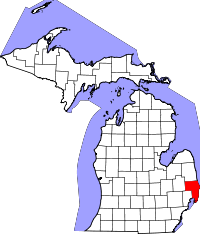 While many counties in Michigan were renamed by early 19th century scholar and explorer, Henry Schoolcraft, Schoolcraft County is the only one named for him, rather than by him. The county is one of the largest in the state as far as actual land area, but, like many of the counties in the northern half of Michigan, has a fairly small population. The County Clerk's office is also small, limited to two vital records researchers simultaneously, and is open during normal business hours. To schedule an appointment, individuals can email or call the office. All records listed with the County Clerk begin in 1870, except for divorce records, which don't have a specific start year and instead begin in the late 1800s, in general. Only birth certificates older than 110 years are open to the public, and certificates younger than 110 years are restricted to the family of the registrar.